Might dance therapy help one's gait? : image via bathknightblog.comGait, known as the sixth vital sign, measured at any speed below .6 meters per second is considered 'a red flag' for older adults. People with a slow gait are more likely to be dependent on others for care, more prone to falls and the concomitant broken bones, and more dependent on pain relief medication. 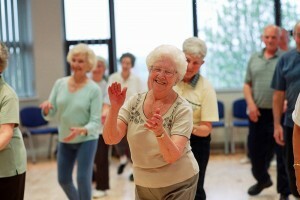 Researchers at the University of St. Louis looked into the possibility that dance, a once very popular activity of the elderly (during the 1940's and 50's, for example), might help increase and stabilize gait as well as help reduce pain and stiffness in the hips and legs in older persons. Dance was a chosen method of rehabilitation for the study because it enhances both physical and cognitive abilities, and offers social interaction as well. Specifically, Healthy Steps (The Lebed Method), which is frequently used in physical and occupational therapy programs, was chosen as the dance method for the study. Warm-ups and cool-downs were included in the 45 minute sessions, and the dance steps could be done either sitting or standing. Two groups of 62+ year-old persons with lower extremity pain, intermittent or frequent, were chosen for the study; one group participated in the Healthy Steps program in addition to their normal exercise routine (walking and group exercise), the other group just maintained their normal exercise routine. After 12 weeks of the study, the dance group succeeded in increasing their gait speed, not by a lot, but by enough to suggest it was the dancing that contributed. The dance group had less pain in their knees and hips than they experienced before the program began, and the group reduced its use of pain meds by 39 percent during the course of the study. The control group, rather, increased intake of pain medication of 21 percent during the same period. The Healthy Steps program was modified in this study for the age group, which included subjects well into their 80's (the average age was 80). It was a small study, just 34 participants, but its results coorborated other studies showing that dance therapy, when appropriately structured for disability and age groups, is an effective means of improving gait and reducing pain in the lower extremities. Pain, in itself, increases dependency. Is Your Invention The Next Biggest Thing? Prove It At The Dallas Market Center’s The Next Big Thing Contest!